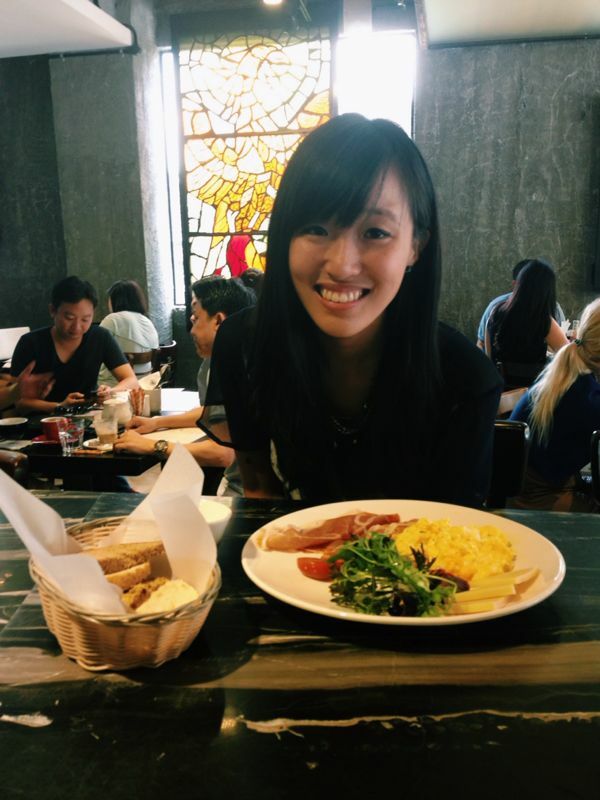 located along a quiet street in the kampong glam area, maison ikkoku is possibly one of my new favourite places for brunch in singapore! 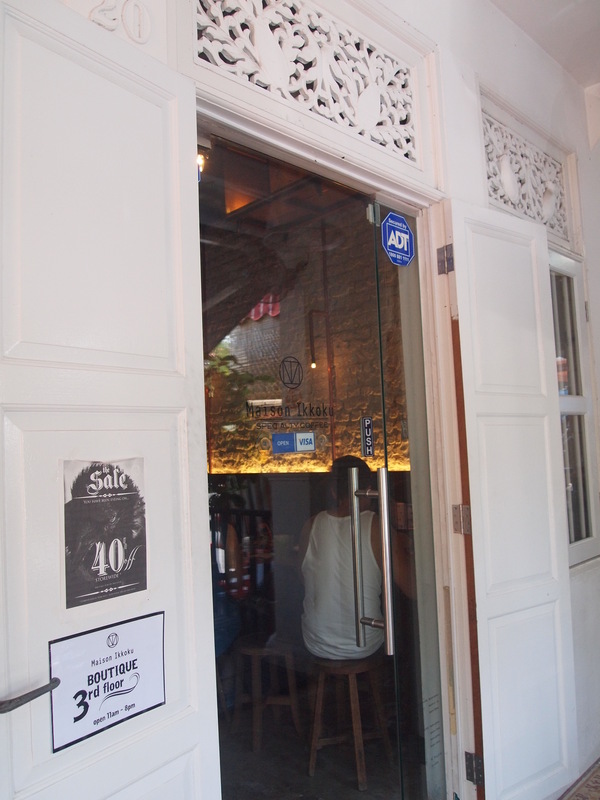 the cosy cafe is located on the ground floor of a 3-storey shophouse, while the second and third floors house a boutique and cocktail bar respectively – all part of a multi-concept lifestyle store that the people behind maison ikkoku are trying to sell. 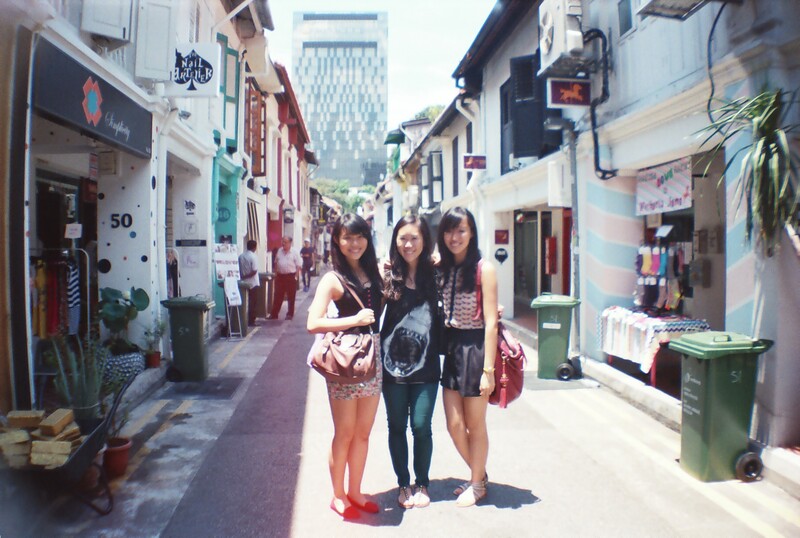 i visited a week and a half ago and was extremely satisfied and impressed with the food – what better way to spend a saturday morning than with 2 of your bestest friends and amazing brunch food? 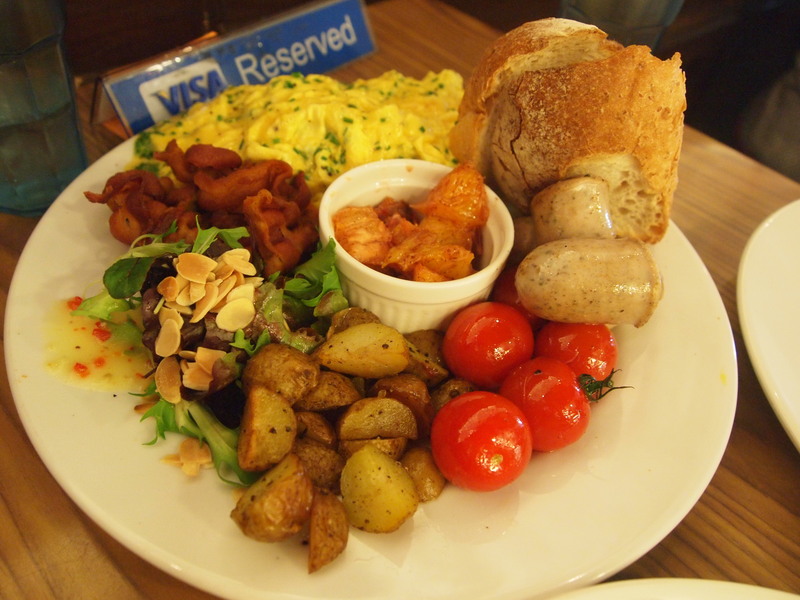 on weekdays, they only serve a limited range of breakfast items, and for a short 2 hours from 9am-11am (their weekday menu can be found on their website at http://www.maison-ikkoku.net/). if getting up before 10am and making your way to kandahar street proves to be a bit of a challenge for the more sleep-inclined among you, then besides the fact that its probably a lot more crowded on weekends, heading over on a saturday or sunday instead is a great alternative! 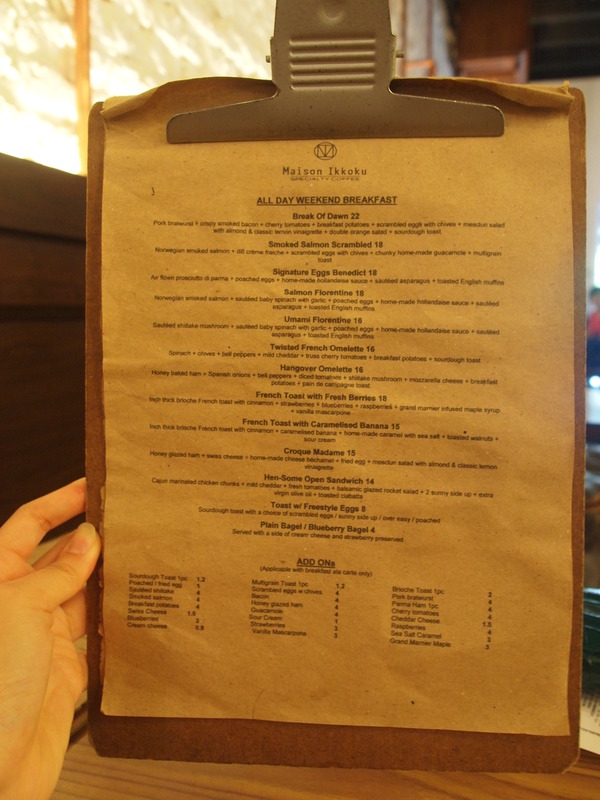 the weekend menu is extensive and has an exciting range of all day breakfast items to choose from, which i love! we ordered 3 items to share, and they were all super yummy. 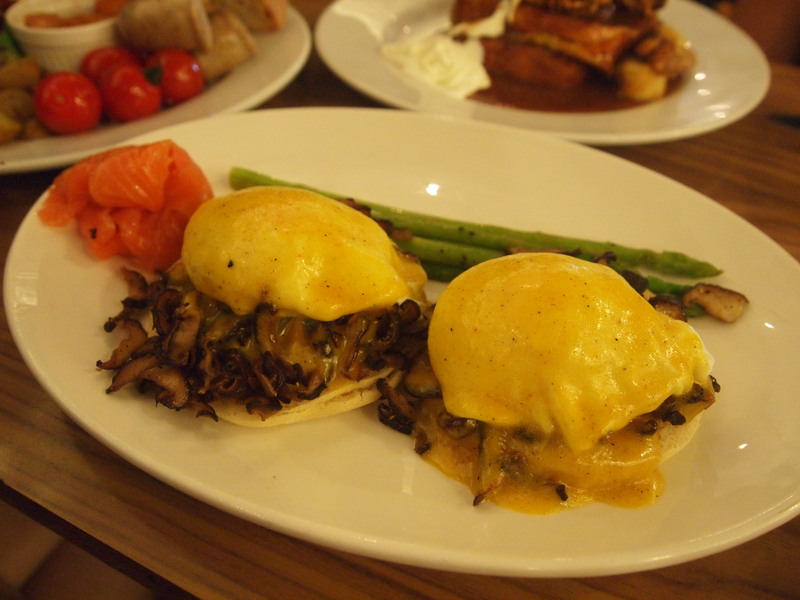 the first thing we got was the umami florentine – sauteed shiitake mushrooms + sauteed baby spinach with garlic + poached eggs + hollandaise sauce + sauteed asparagus + toasted english muffins! we also added smoked salmon on the side. 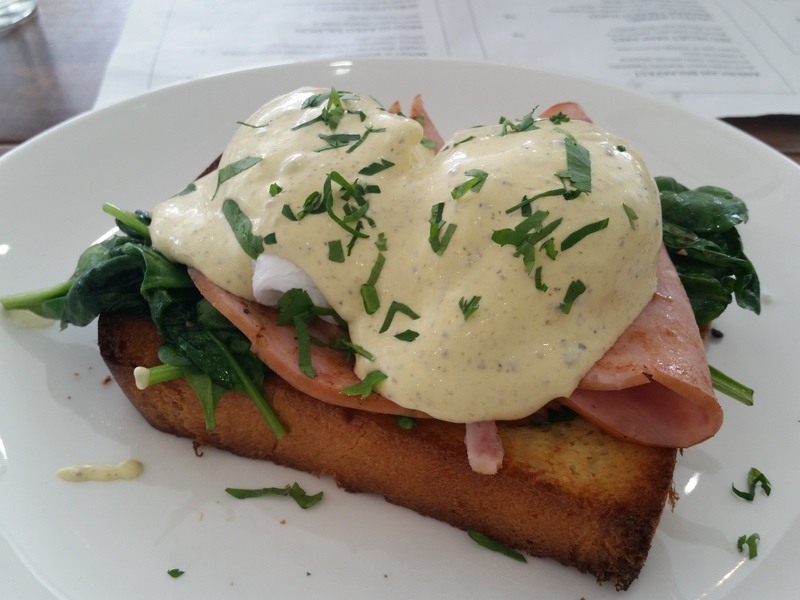 this dish was one of the BEST eggs benny/eggs benny variations that i have had. being a mushroom lover, i loved the addition of shiitake mushrooms which were perfectly cooked and plated in copious amounts (so much so that the sauteed spinach under the mushrooms is completely obscured). it was something different from the usual portobello mushrooms typically used in brunch food, and complemented the sauteed spinach perfectly. the spinach sauteed with garlic taken together with the mushrooms and finally topped with perfectly poached eggs was an amazing combination. the homemade hollandaise sauce was also wonderfully done; it was light (not jelat at all) and its consistency was just nice, bringing everything together very nicely. couldn’t get enough of it! 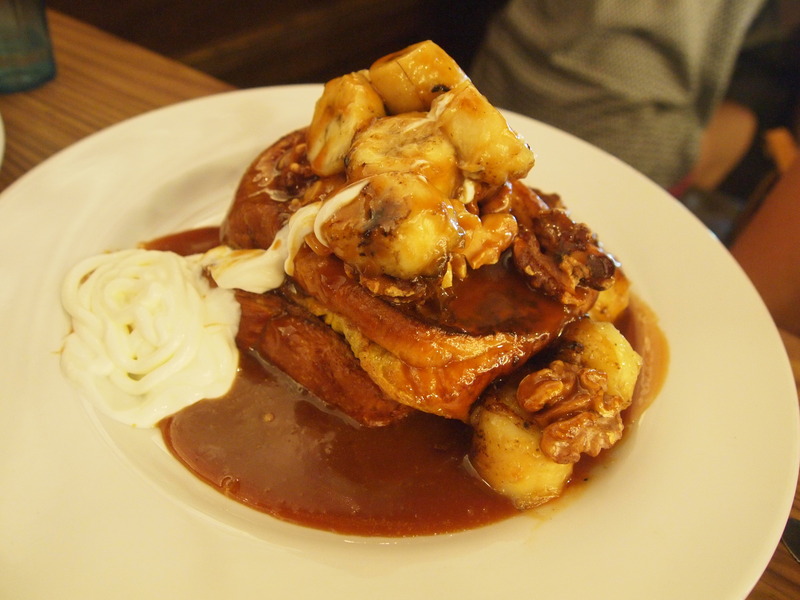 the next thing we ordered was the french toast with caramelised bananas – thick brioche french toast with cinnamon + caramelised bananas + home-made caramel with sea salt + toasted walnuts + sour cream. if you like sticky cinnamon buns, this will be heaven on a plate for you. i happen to absolutely adore sticky cinnamon rolls so this was amazing to me – not only was the presentation super enticing with thick toast stacked on top of each other, piled high with caramelised bananas and walnuts, and drenched in an amazing caramel/cinnamon sauce, it also tasted really really good. didn’t taste much sea salt (as mentioned in the description) at all though, and we barely touched the dollop of sour cream by the side, (both of which were probably meant to balance out the sweetness of the toast i imagine) but that’s probably a good sign because i suppose we didn’t think we needed any of it, ie the toast wasn’t sickly sweet at all! the bananas were yummy, the toast was really thick and fluffy, and the walnuts were fresh and added a great crunch and texture to the dish. 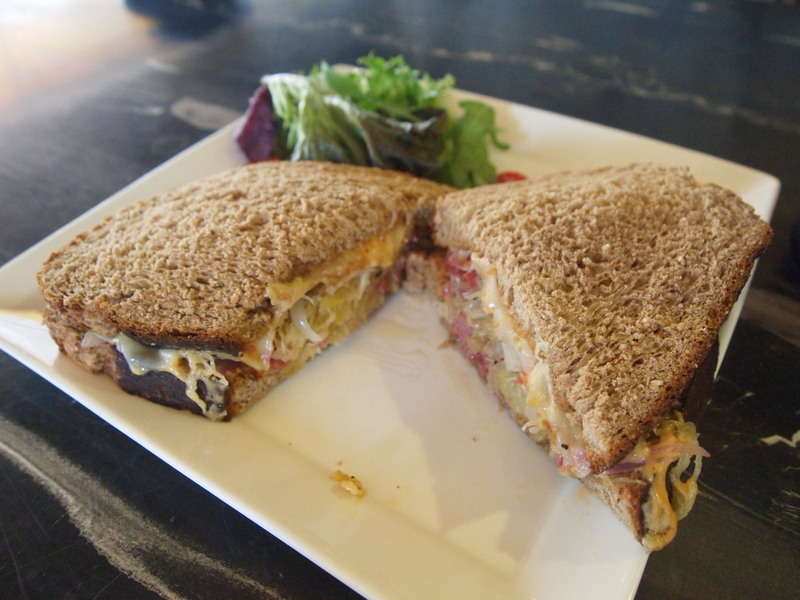 it is actually as filling as it looks in the picture though, so i think it’d probably be a bit too much for one person to stomach without feeling like its too heavy; this is ideal for sharing and is a lovely sweet lift to the usual savoury brunch options. the third thing we ordered was the break of dawn – pork bratwust + crispy smoked bacon + cherry tomatoes + breakfast potatoes + scrambled eggs with chives + mesclun salad with almond & classic lemon vinaigrette + double orange salad + sourdough toast. this is hands-down one of the most value-for-money brunch dishes i have ever had. seriously. at bigger establishments like wild honey, you’d probably pay more than this and get something barely 1/3 the size? 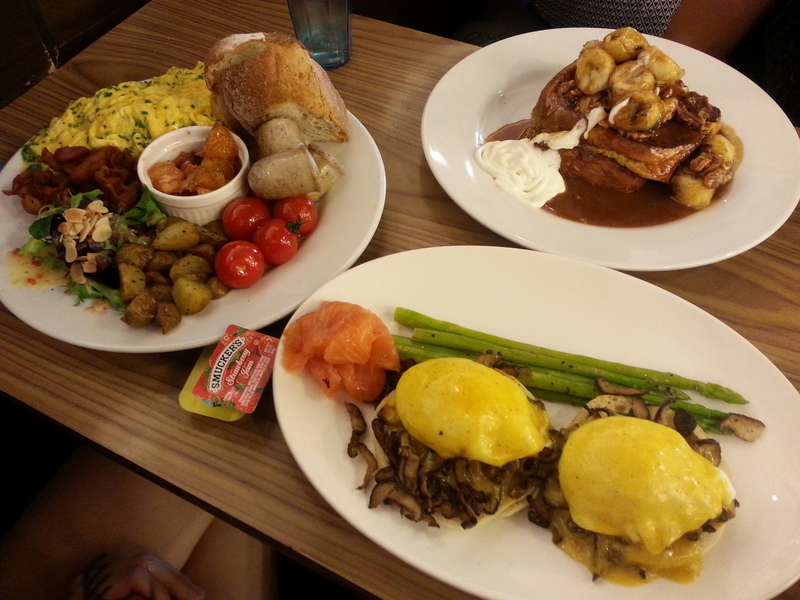 just check out the size of that plate – it was HUGE and piled high with an array of breakfast foods. i think two average eaters can share this plate very comfortably and leave feeling very satisfied! each component on the plate was good which i thought was no mean feat, given that its rather hard to achieve that with the number of different things they served up. the bratwurst was of a good quality (not at all the processed kind of sausage), and the cherry tomatoes were amazingly sweet, fresh and juicy. we all loved how they were the kind that are still on the vine when you buy them, and not the more run-of-the-mill oval-shaped ones. the potatoes and bacon were not bad too – well-fried and not too greasy. as for the mesclun salad and the orange salad, they were both very enjoyable additions to the plate to cleanse the palette in between bites of heavy breakfast food. the greens of the mesclun salad were fresh and the almonds added a nice crunch to the leaves. i also loved the lemon vinaigrette which was light and refreshing. as for the oranges, they were drenched in cinnamon and i’m not sure what they were meant to be eaten with, but they were delicious all the same and as i mentioned earlier, something refreshing to accompany the more greasy foods on the plate. the scrambled eggs were delicious. we all loved the addition of chives and they were light, fluffy and creamy – a worthy competitor of nassim hill’s scrambled eggs, i thought. 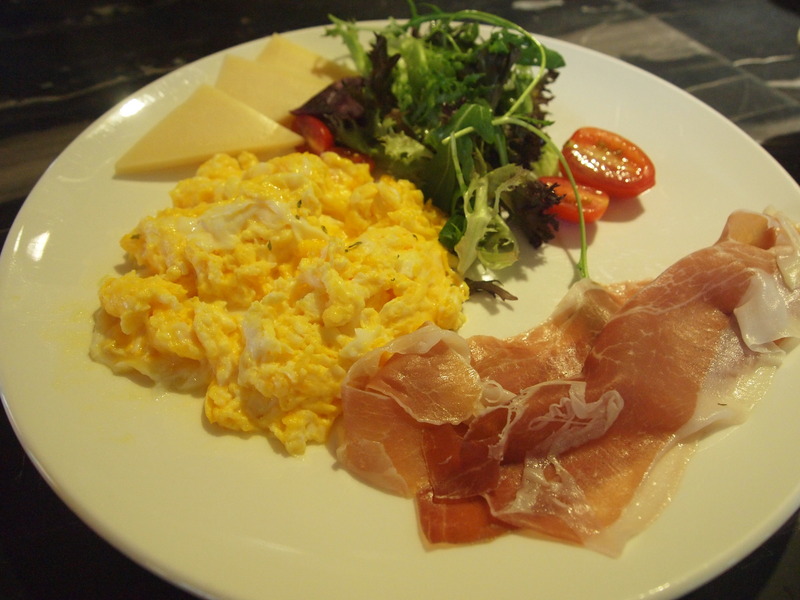 they also gave a huge serving of scrambled eggs (we couldn’t finish it even among the 3 of us); not sure if you can see it in the picture but it was really a very big pile, plenty to be eaten with each component on the plate. last but not least, we had 2 thick pieces of sourdough, which was really welcome as an accompaniment for the hot foods on the plate to be piled high on. 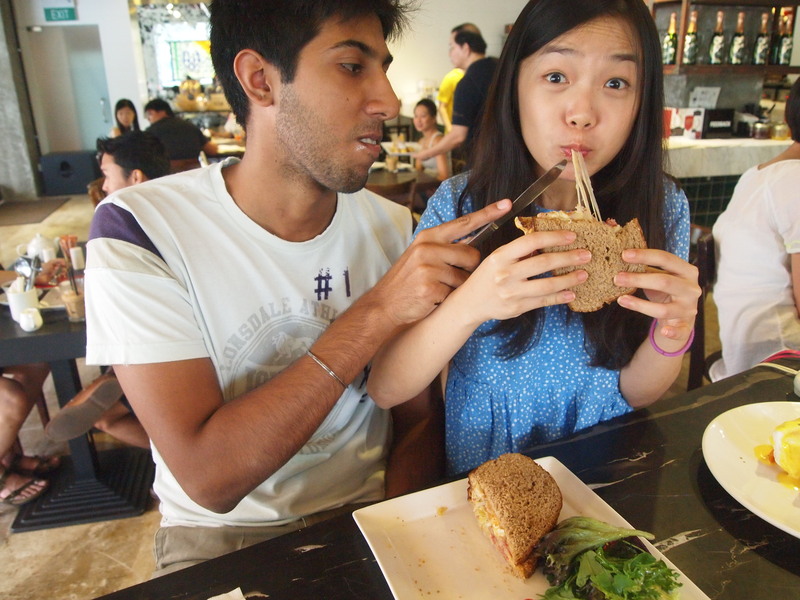 despite the fact that the 3 of us are pretty big eaters, we did not manage to finish everything we ordered. we came pretty close though, because the food was so yummy that even though we were full, we kept picking at the remnants and going back for more bits and bobs left on the plates. unfortunately that left us with no space for desserts! 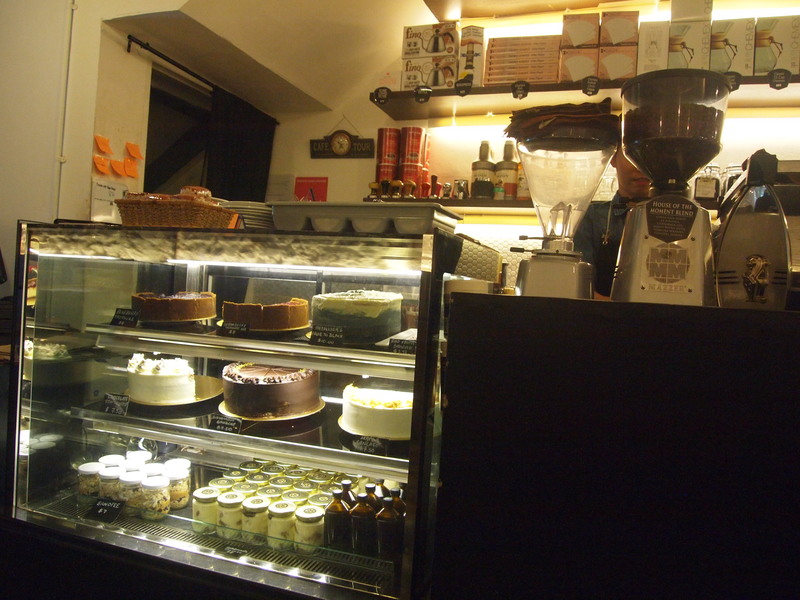 they have several interesting cakes in the display, which i hope to try the next time i visit! we were especially intrigued by the “fade to black” cake that is meant to be a tribute to Metallica. 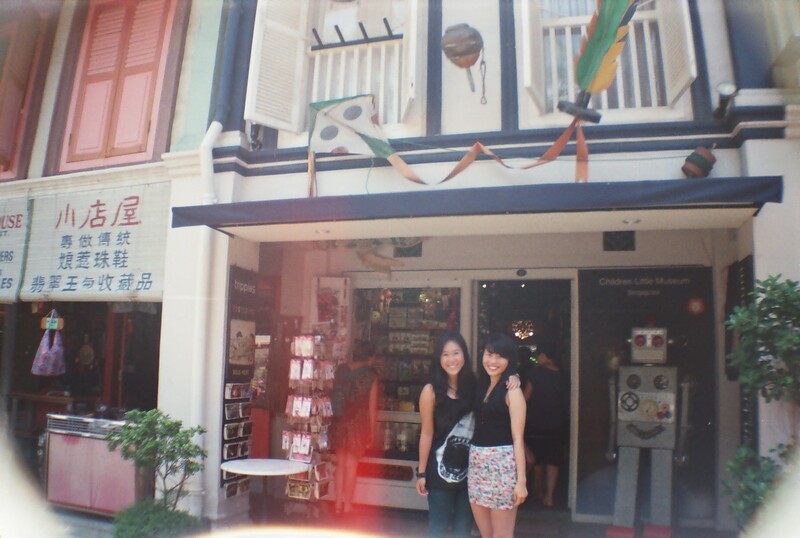 the coffee is also supposed to be good, but we didn’t have any as we found the prices for the drinks slightly steep. 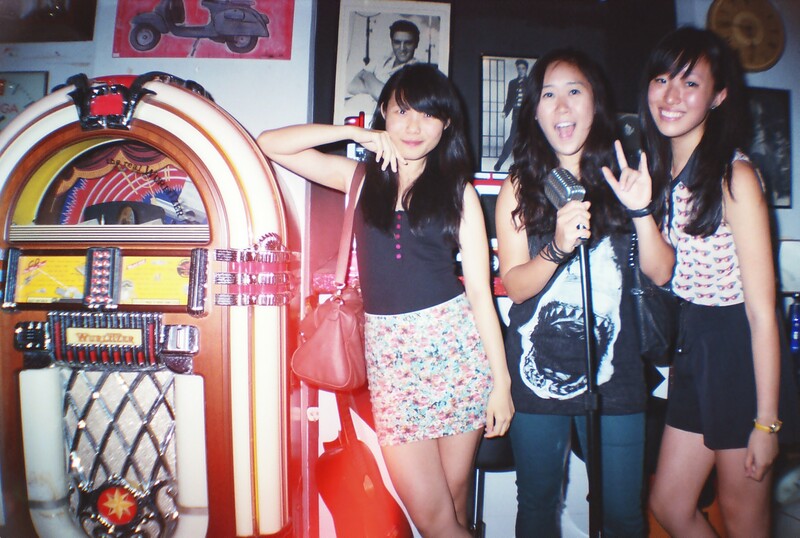 all in all, we thoroughly enjoyed what maison ikkoku has to offer. great food with generous servings at very reasonable prices – no additional service charge added, so what you see on the menu is what you pay! 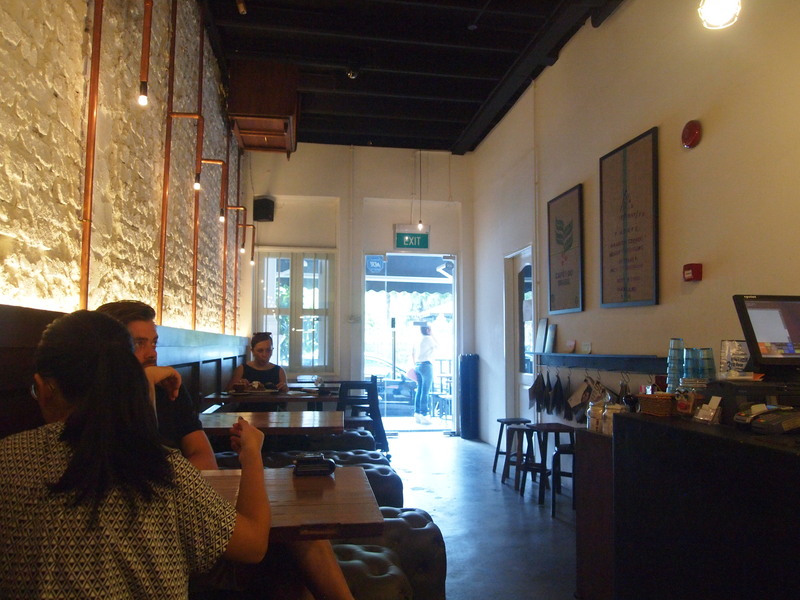 its a great little place to hang out that has a very chill vibe, the kind of unpretentious place where you order at the counter and get water for yourself. 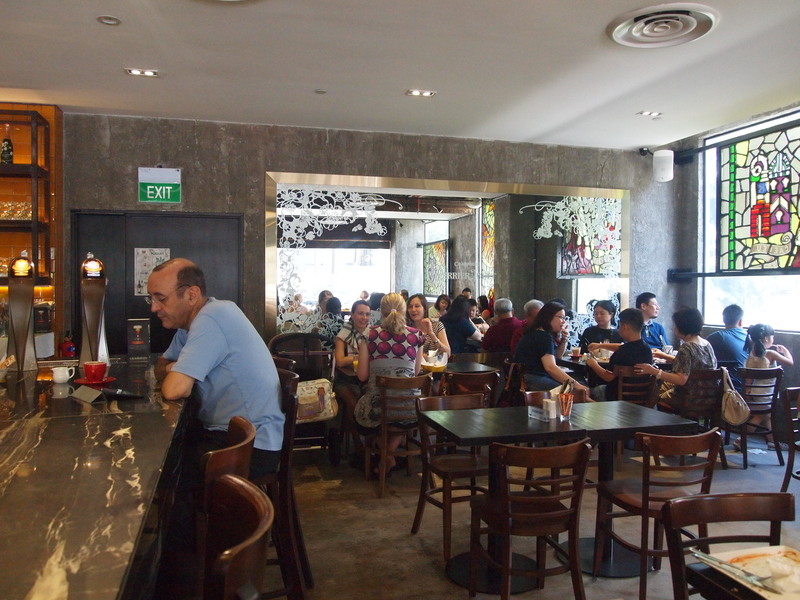 the cafe is pretty small and it does get very crowded on weekends (we witnessed several people being turned away/being told to wait about 30 minutes for a table), so making a reservation is definitely recommended if you’re planning on going at brunch peak hour (about 11am onwards). ps. rich & good cake shop a few doors down has some great swiss rolls in variety of local flavours to offer – pop by & give it a try!!! 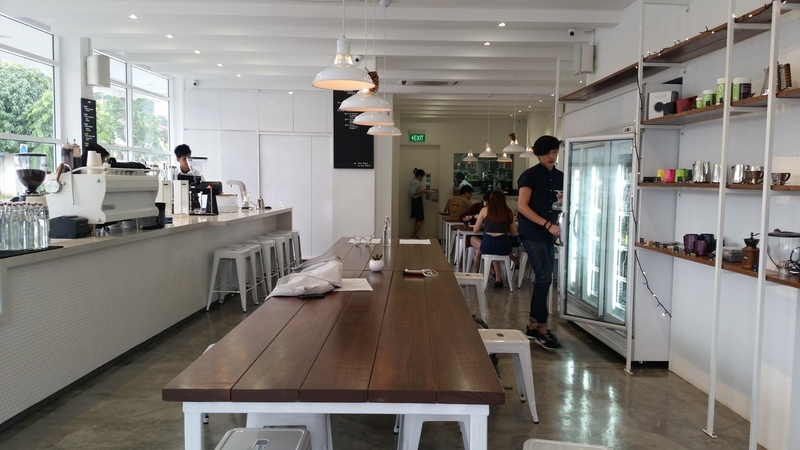 tucked away from the hustle and bustle along main orchard road but still conveniently located at the post office building opposite tanglin mall, nassim hill bakery is a great spot to chill and unwind over good food either before or after (or both!) battling the crowds in town. i visited on a saturday morning and was able to get a table quite easily although there was a constant stream of customers and almost all the tables were occupied at any one time. we didn’t manage to get one of the individual tables though, and ended up at the big communal table in the centre of the cafe. but it wasn’t bad at all – the table is big and chairs are well-spaced such that everyone can sit comfortably in groups without feeling like you’re too close to your tablemates. 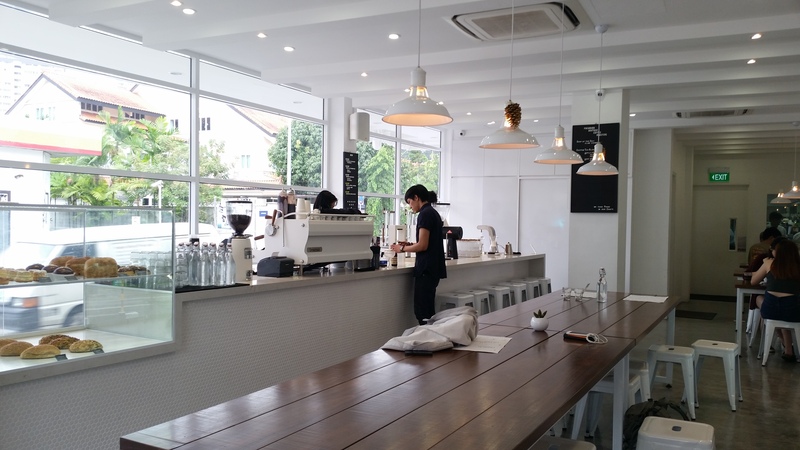 its a nice, bright and open space that gives off the vibe of a casual neighbourhood joint; the kind of place where people sip coffee and read books while their dogs sit by their feet wagging their tails. 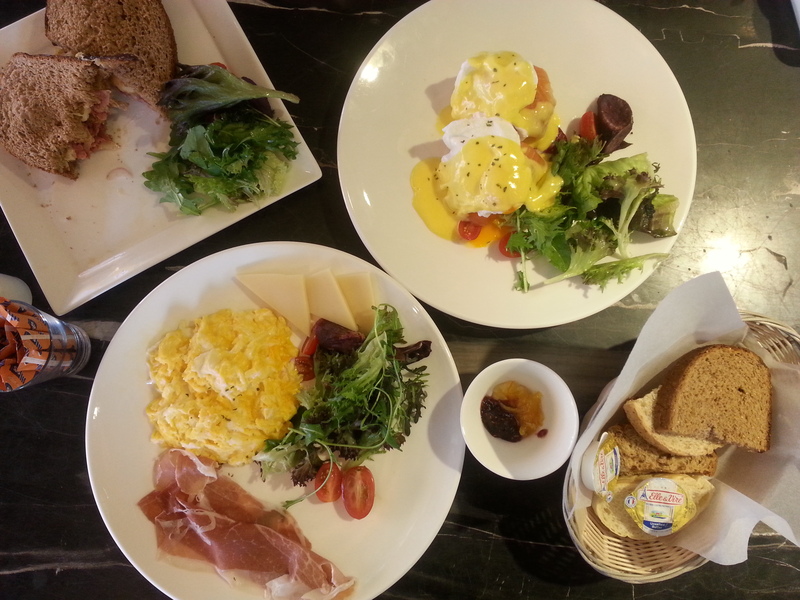 they serve a range of breads, cakes, sandwiches, soups, salads etc but it was the brunch food that we were drawn to. after extensive deliberation and lots of indecision (food choices are always life-changing decisions), we settled for an eggs benny (but with salmon not ham), a scrambled eggs with prosciutto and a hot reuben sandwich (manly food for the lone man at the table). the scrambled eggs did not disappoint and were the highlight of the dish. i thought they certainly tasted as good as they looked! they were light, fluffy, soft, buttery, creamy, smooth, and moist but far from being too wet. (feel free to add in any other adjectives you would use to describe really good scrambled eggs; am pretty sure these will fit the bill.) not sure if you can see it clearly in this picture, but i also liked the fact that they weren’t scrambled to the point of them becoming a mass of single-coloured light yellow eggs. instead, they were of varying shades along the spectrum of white to yellow. they also went perfectly with the saltiness of the prosciutto, the swiss cheese and the accompanying bread in the bread basket. 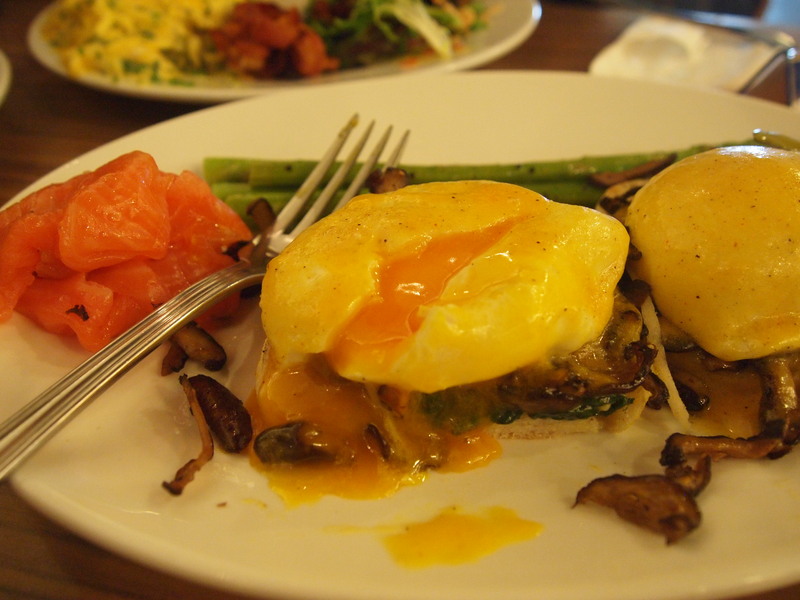 the eggs benny, often dubbed one of the best in singapore, was pretty good too! my friend changed the ham to salmon but for those of you who want to stick to the standard order of ham, i observed from people dining around us that the ham they use is what i like to call proper ham – not at all like the lousy ultra thin slices of pre-packed picnic ham you get at supermarkets. the slices are thick and looked very tasty! 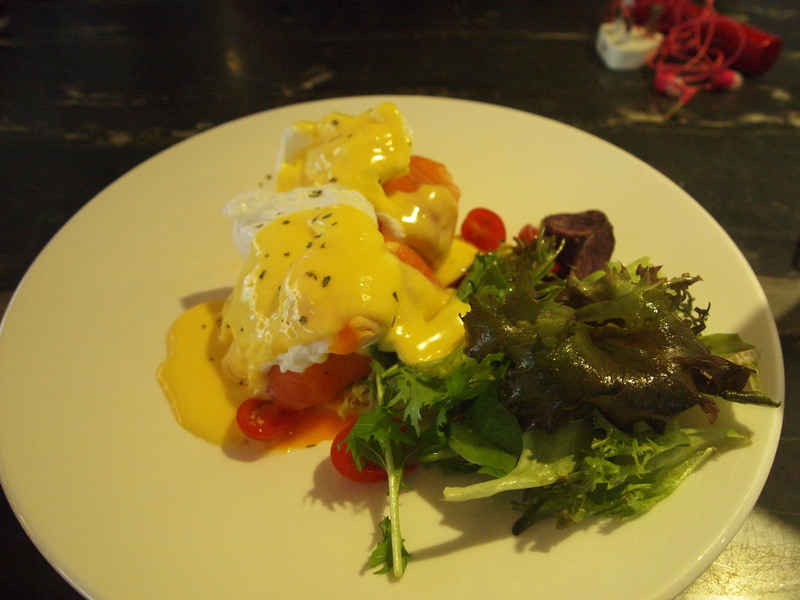 the hollandaise sauce was one of the better ones i’ve tasted, and the eggs were perfectly poached. 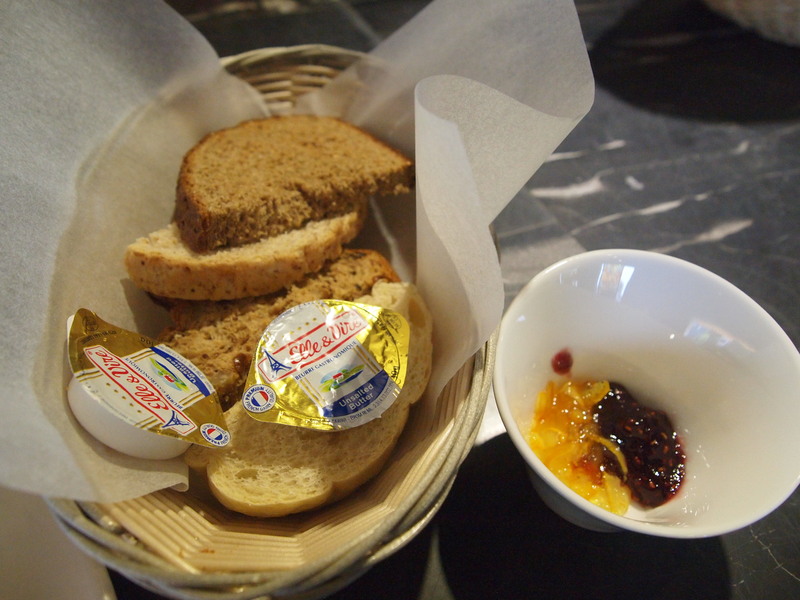 i also liked how the muffin used was white ciabatta which was really fluffy and yummy. everything tasted really good together! 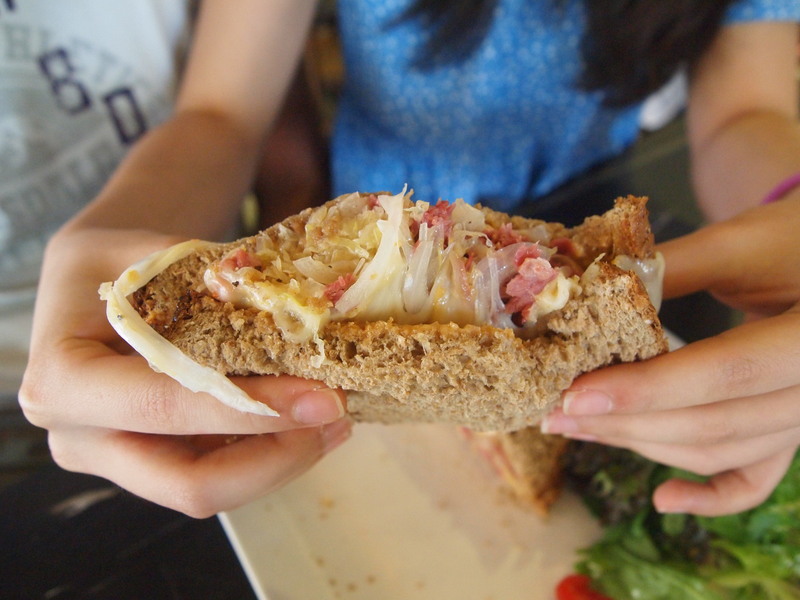 the last thing we ordered was the hot reuben sandwich. the serving was huge! perfect for a hungry boy but definitely too much for an average girl. it probably doesn’t look that big in the picture below, but check out the following pics with people as scale and you’ll see how generous a serving it is. what i also really like about this place is that there’s no additional service charge or gst so what you see on the menu is what you pay. there’s free parking right outside as well, though the number of lots is quite limited. getting a space on a weekday will probably be no problem though. 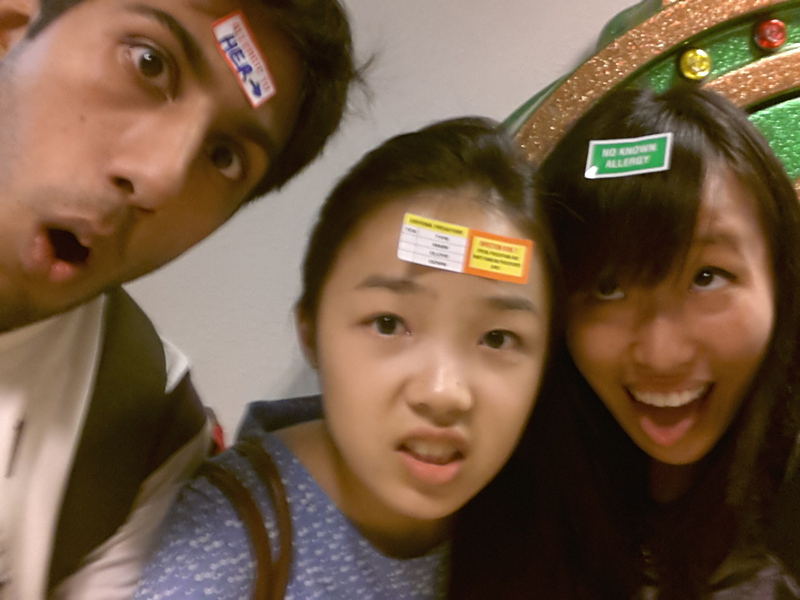 the verdict: definitely worth checking out!